5:00 to 7:00 pm at The Iron Post. The Prarie Dogs, with C4A faculty members Josh Houchin & Steve Meadows is a perennial favorite, with their entertaining offering of bluegrass & country-western tunes. 7:00 to 8:00 pm at the Landmark Hotel: The New Orleans Jazz Machine, with C4A faculty member Josh Houchin, will knock out a set of Dixieland and Swing tunes. 9:00 to 10:00 pm at Pizza M: The Dump Chickens, with C4A faculty members Tom Faux & Wayne Logue, will offer a rollicking set of old-time tunes. 10:15 to 11:00 pm at The Rose Bowl: The Hot Iron String Band, with C4A faculty members Sam Payne & Jeremy Koch, will share their blend of early bluegrass, honky tonk blues, and gypsy swing. 10:15 to 11:00 pm at Pizza M: Tiny Arms, with C4A faculty member Amanda Ramey, will play a set of old-time tunes for your listening pleasure. 11:30 to 12:30 “Fiddle from Scratch” workshop for absolute beginners. C4A faculty member Robin Kearton will get you jamming with her on at least one tune! In C4A’s new front room. 3:30 to 4:30 Ukulele workshop with C4A faculty member Steve Meadows. This is a hands-on workshop too! In C4A’s downstairs rehearsal room. 8:15 to 9:15 at Landmark Hotel: Yiddish dancing featuring music by Don’t Ask! with C4A faculty members Amanda Ramey & Sam Gingher. 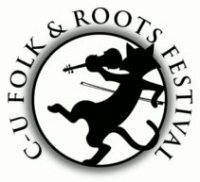 Check the CUFRF website for more about this festival!